If It's Too Loud...: Thurston Moore - "Mx Liberty"
A lot of Thurston Moore's post-Sonic Youth work has been on the mellower side. With his new single, "Mx Liberty," that is changing in a big way. "Mx Liberty" is the heaviest Thurston has been in years, Twilight excluded. It's an incredibly punk sound, but not in the way Sonic Youth could be considered punk. His guitar playing will always sound like his guitar playing which will give off a certain Sonic Youth vibe. But it's... different this time. He hasn't played with this sense of urgency in decades. It's a heavier, crunchier sound to it, and the riffs are simply ferocious. Plus, the vocals are somewhere between chanting and shouting, giving off an almost hip hop feel. This is the most interesting thing Thurston Moore has recorded in a long, long time. According to the label, the song is "... a punk rock broadside to the current man-boys of the USA government in response to their mockery of democracy," in case you were unaware of Moore's feelings on the current U.S. government. You can listen to "Mx Liberty" below. It will be released as a 7" on February 19 (President's Day, not coincidentally) through Blank Editions. You can get your copy here. 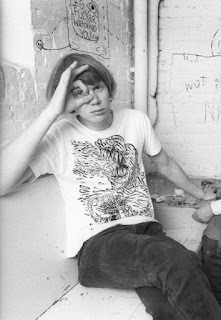 For more on Thurston Moore, check out his website.